Separated by a hundred years, in the 13th and 14th centuries, Rumi and Hafiz were Persian ecstatic Sufi mystic poets, whose work celebrated and encouraged union with the Divine. 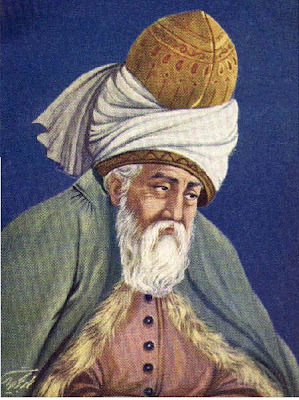 Rumi (1207 to 1273) was born in the eastern-most province of Persia, but his family fled west during the Mongol invasion, and he lived most of his life in the Sultanate of Rum, in present-day Turkey. There’s a closeness beyond that. In one wheat-grain a thousand sheaf-stacks. Rumi inherited from his father the position of sheik in the dervish learning community. He believed in the use of music, poetry and dance as a path for reaching God. He believed all religions are “more or less truth”. Devotees of his work report Rumi sang, whirling around in ecstasy, hour after hour. From these ideas, “whirling dervishes” developed into a ritual form. Love made him a madman in the eyes of some of his followers. Instead of lectures, Rumi would spin around a column in the mosque singing out his love-praises in verse. In 1248, Shams disappeared, and it was rumoured he was murdered out of jealousy by some of Rumi’s devotees, perhaps assisted by Rumi’s own son. On the death of his teacher, Shams, the one who had set his heart on fire, Rumi’s public life began. are alive and looking for lovers. His teacher’s death unleashed a torrent of ecstatic poems. for the taste of fire. The sky itself reels with love. inside all of us, one peace. Poet, let every word tremble its wind bell. Saddle the horse with great anticipation. Every morning, a new arrival. Meet them at the door laughing and let them in. Each has been sent as a guide from beyond. 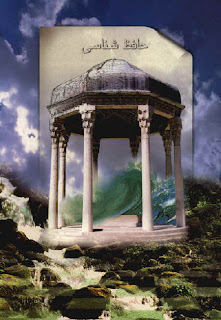 Rumi felt Shams was writing the poems that followed his death, and he called the collection The Works of Shams of Tabriz. He spent six years dictating to his scribe and favourite student ,Hussam, the six volume poem The Matnawiye, considered by many to be the greatest work of mystical poetry – 27,000 lines of Persian poetry! Rumi’s shrine became a place of pilgrimage. 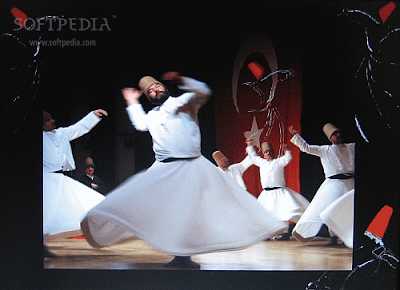 After his death, his followers founded the Sufi Order of Whirling Dervishes. Hafiz came along a hundred years later (1320 to 1389). He lived most of his life in Shiraz. He is considered the most beloved poet of Persia, and one of the finest lyricists in the Persian language. He was a devout Sufi. He lived about the same time as Chaucer in England. He became a famous Sufi master, a philosopher and a mystic of Islam. Hafiz wrote an estimated 5,000 poems, only five to seven hundred of which survived. The rest were destroyed by clerics and rulers who disapproved of the content. Hafiz was considered “a spiritual rebel whose insights emancipate his readers from the clutches of those in power,” observes Daniel Ladinsky, in his introduction to The Gift, his translation of the poems of Hafiz. “Hafiz brings us nearer to God. This Persian master is a profound champion of freedom; he constantly encourages our hearts to dance!” So writes Ladinsky. Hafiz’s Divan – his collected poems – is considered a classic in the literature of Sufism. My words nourish even the sun’s body. she laid with me again last night. Hafiz knew the entire Quran by heart. Unlike Rumi, Hafiz knew poverty. The youngest of three sons of poor parents, Hafiz worked as a baker’s assistant to help support his family. He put himself through school at night. Hafiz was a skilled draftsman and occasionally worked as a proofreader or copyist. Even as a child, he improvised poems in any form or style. He won the patronage of a succession of rulers and wealthy noblemen, was court poet and a college professor in his middle years. He married and had at least one son. He was blacklisted by the rigorously orthodox when they came into power and, at least once, was forced into exile to live in dire poverty till a more tolerant regime allowed his return. He was predeceased by his wife and son. Hafiz spent forty years as a student of his spiritual teacher Attar, beginning his spiritual journey by being awakened by love. He was a Master Poet by the age of sixty, and died at sixty-nine. your beautiful, parched holy mouth. Neither Hafiz’s corpse nor his life negate. With all his misdeeds, heaven for him waits. He was given the burial. His tomb still stands. This piece on Rumi and Hafiz was written by Sherry Blue Sky, a regular contributor to Poets United. If you would like to learn more about Sherry you can do so by checking out her “The Life of a Poet” interview (found here on Poets United) or by visiting her poetry blog Stardreaming. Sherry is a regular contibutor to Poet United and its many activities and posts so come back often if you enjoy reading Sherry's work. Well there is a too much history of music but unfortunately we are not getting interest in it we should have to do this i am happy to read your post because you have took step for this. A fascinating look at the Persian culture through two of it's iconic poets. If only the modern world could embrace their wholistic views on religion and brotherly love; it would be a better place for all. I loved this article Sherry. Thank you very much for writing and researching. Both Rumi and Hafiz are favorites of mine and have gained quite a bit of popularity throughout the world. It is interesting to know and understand how their lives and background influenced their work and words. So glad you enjoyed it. I love the beauty of their words - timeless, and so applicable to life today. I think its important to note that Barks does not know the Persian language and therefore he is not a translator. 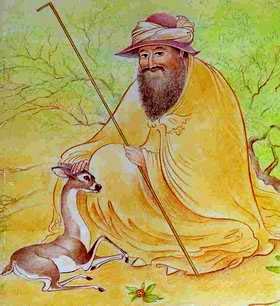 His renderings (based on other English translations of Rumi) are beautiful, but they are part Rumi and part Barks. For those interested in Rumi's true words, there are translations available. Thank you Sherry. This is a quick look into the life of a fascinating poet who inspired many forms of poetry. I was first introduced to Rumi after reading Chasing Rumi by Roger Housden. Perhaps you might enjoy this beautiful book as well. Oh that sounds great, Nino, will track it down at the library! I love the sher beauty of their words. I have a cd of beautiful music, with some of Rumi's most beautiful quotes being spoken to the music. Sublime!!!!!! Yesterday I watched a concert of Depeche Mode and on the screen where videos are played while the group performs was shown for couple of minutes a poem from Hafiz - "I Have Learned So Much". I liked it very much. I know it speaks the truth. I read more poems from Hafiz in internet. I can straight away say that he is the autor who writes with most inspiring and shining words I have come across so far. It's good to become popular among people because what he says is what more should understand. I thought it will be good to leave it here in case someone want to see good selection of his works! I have long loved these two poets and now know a lot more about them. Thanks, Sherry! WoW! Sherry, this is a fantastic article! I'm glad I came across this. My knowledge of famous poets is very limited so I'm always taken by these stories. I should spend more time here to broaden my horizon (smile). Thanks for posting this, Sherry. I especially appreciate it. To iins: Thanks for the link. I shall definitely pay a visit there. No news but a fragrance, a tenderness. Poem of the Week (5 October 2010) City a.m.